When you think ‘winter’ you don’t automatically think ‘garden’. You’ve spent all that time and money during the summer on getting your garden right, in roll the dark nights, you get home from work only to find a black abyss as you peer out of your window towards your borders. Being a contemporary garden designer in Cheshire I am all too aware of the climate and lets be honest, it’s not the Algarve. Wet and windy conditions are another reason not to head outside at this time of year. Having said that, with the right mood lighting those dark, wet and windy nights can be something of a spectacle whilst sat in the warmth and comfort of your living room. In fact many of the gardens I’ve designed in the past have often looked their best at night. You get to see textures you wouldn’t normally notice and highlight plants with architectural forms that look impressive during the day but staggering at night. You can expect to spend approximately 5-10% of your budget on lighting but you’ll get 50% more garden throughout the year. Worth it? 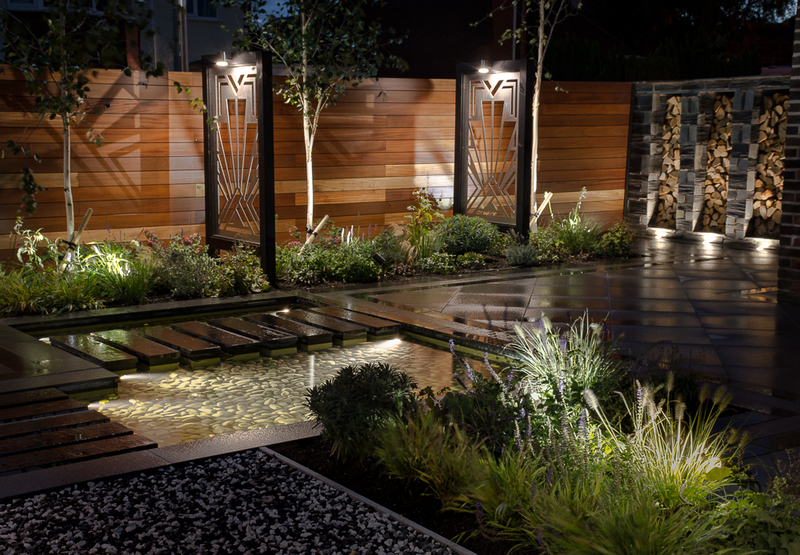 Without doubt, lighting is one of the most important features of my designs and when designing your garden I will create a lighting scheme as part of the design service. Keep an eye out for future blogs for information on lighting schemes, techniques and tips and tricks.